21. The Holy Father has announced the next meeting in Assisi. 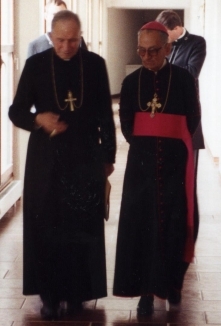 You reacted in your sermon at St. Nicholas Church on February 9, 2011, and decided to oppose it, just as Archbishop Lefebvre had done at the time of the first meeting, 25 years ago. Do you plan to intervene directly with the Holy Father? If the opportunity presents itself, if it can bear some fruit, why not? 22. Is it such a serious matter to call other religions to work for peace? In one respect, and only in that respect, no. To call other religions to work for peace—a civil peace—there is no problem with that, but in that case it is not at the religious level, it is at the civil level. It is not an act of religion, it is quite simply an act of a religious society that works civilly to promote peace. It is not even religious peace being sought, but rather civil peace among men. In contrast, to ask people to perform religious acts during that gathering is absurd, because there is a radical lack of understanding among the various religions. In those circumstances, it is not clear what aspiring to peace is supposed to mean, when there is not even any agreement about the nature of God, about the meaning that you ascribe to divinity. Really, you wonder how you could achieve anything serious. 23. We might think that the Holy Father does not understand ecumenism in the same way as John Paul II. Isn’t this a difference in degree in the same error? No, I think that he understands it in the same way. He correctly says, “It is impossible to pray together.” But we have to see exactly what he means by that. He gave an explanation in 2003, in a book entitled Truth and Tolerance: Christian Belief and World Religions (English edition: Ignatius Press, 2004). I find that he splits hairs. He tries to justify Assisi. You really wonder how that will be possible next October. 24. Some Italian intellectuals have publicly declared their uneasiness about the consequences of such a meeting. Do you know of other reactions within the Church? They are right. Do we see other reactions within the Church? In official circles, no. Among us [SSPX members], obviously yes. 25. What about the reaction of the traditional congregations affiliated with Ecclesia Dei? There is none that I know of! 26. 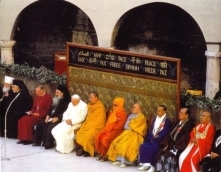 How do you explain the fact that the Holy Father, who denounces relativism in religious matters and who had even refused to attend the Assisi meeting in 1986, could now want to commemorate such a meeting by repeating it? It is a mystery to me. I do not know. I think that he may be under some pressures or influences. Probably he is alarmed by the anti-Christian acts [recently in the news], the anti-Catholic violence: those bombs in Egypt and Iraq. That is perhaps the reason that prompted him to propose this new Assisi gathering; I won’t call it an act of desperation, but a last resort…. He is trying something, anyway. I would not be surprised if that was it, but I know nothing more about it. 27. Is there a possibility that the Holy Father might give up this interreligious demonstration? We don’t know very well how it will be organized. We will have to see. I supposed that they will try to minimize the event because, once again, for the present Pope, it is impossible for different groups to be able to pray together when they do not even acknowledge the same god. Therefore, once again you wonder what they are going to be able to do there together! 28. 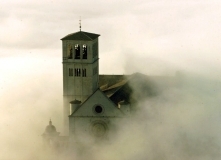 What should Catholics do with regard to this announcement about Assisi III? Pray that the Good Lord intervenes in one way or another so that it doesn’t take place, and in any case start making reparation now!